Now that you know how to load and display an image, it's time to apply a computation to it. For example, you can compute the slope of terrain, by passing the SRTM elevation image to the slope method of the ee.Terrain package. // Load the SRTM image. // Apply an algorithm to an image. Map.setCenter(-112.8598, 36.2841, 9); // Center on the Grand Canyon. 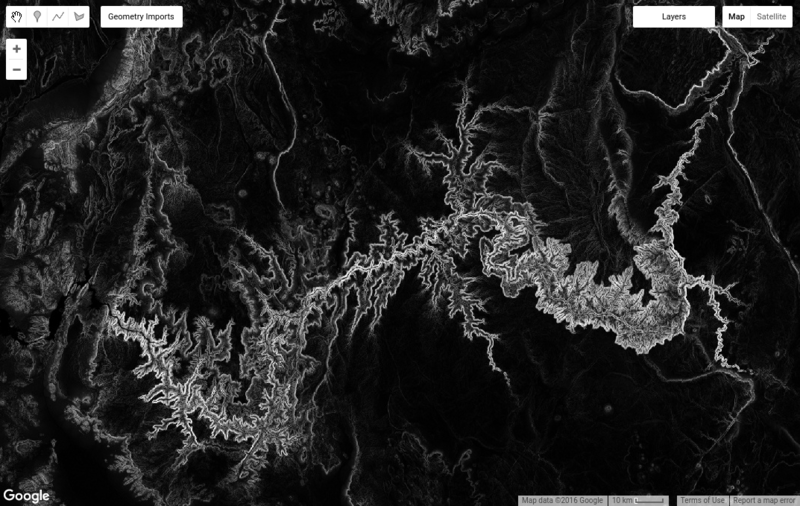 Note that in the code ee.Terrain.slope(srtm), the srtm image is provided as an argument to the slope algorithm. The result should look something like Figure 3. // Get the aspect (in degrees). // Convert to radians, compute the sin of the aspect. The result should look something like Figure 4. It's worth taking a closer look at the aspect.divide(180).multiply(Math.PI).sin() code. By chaining multiple methods like this, the code says, 'divide the aspect by 180, multiply the result of that by π, and finally take the sin'. You can perform complex mathematical operations on images by combining methods in this manner. See the Image docs for a complete list of mathematical operations, add(), subtract(), multiply(), etc. Figure 4. Sin of terrain aspect. Another useful class of operations on images involves computing pixel statistics in image regions, or raster-vector overlays. To compute statistics in Earth Engine, use a reducer as represented by classes in the ee.Reducer package. For example, suppose you're interested in the mean of elevation in some region. You can define a region by drawing a polygon using the geometry drawing tools. To interactively draw a region, get the polygon drawing tool ( ), then digitize a polygon over your area of interest and click Exit when you're done. Note that the resultant ee.Geometry object is automatically named geometry and added as an import at the top of your script. Rename that variable to 'polygon' by clicking on the variable name in the imports and typing the new name. // Compute the mean elevation in the polygon. // Get the mean from the dictionary and print it. Lastly, the return value of reduceRegion() is a dictionary in which keys are band names and values are the pixel statistics for the bands. The get() method on a dictionary returns the value corresponding to the key provided as an argument. 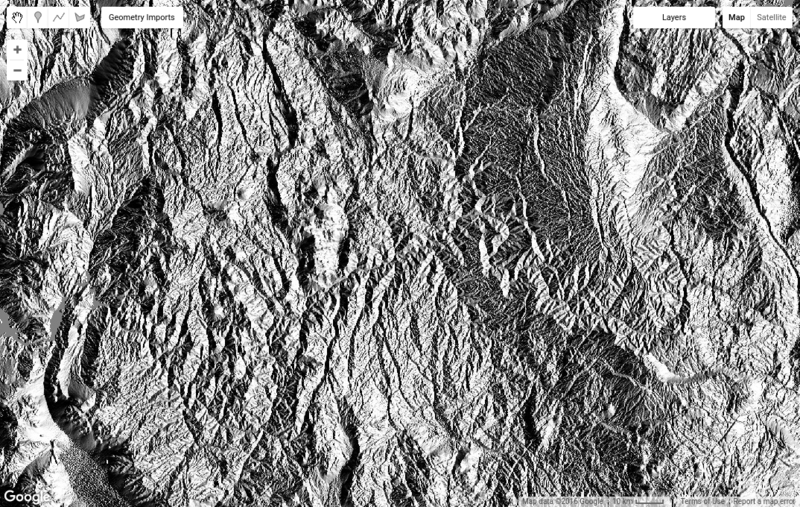 In this case, the srtm image has one band, 'elevation', so the example code gets that statistic from the dictionary and prints it. Image.reduceRegion: Too many pixels in the region. Found 527001545, but only 10000000 allowed. Fear not! There are several things you can do to resolve the error. The reduceRegion() method has a check to make sure you consider whether you really want to include so many pixels in your computation. This is intended to prevent you from accidentally doing something silly, like trying compute the mean of every one-meter pixel in the world (don't do that). To resolve the error, either set the bestEffort parameter to true by adding bestEffort: true to the dictionary of parameters, or set the maxPixels parameter to a value higher than the default of 10 million pixels, or both. If bestEffort is true, Earth Engine will automatically recompute the scale such that maxPixels is not exceeded. If you specify a scale smaller than the native resolution, Earth Engine will happily resample the input image using nearest neighbor, then include all those smaller pixels in the computation. If you set the scale to be larger, Earth Engine will use input pixels from an aggregated version of the input (i.e. get pixels from a higher level of the image pyramid). Learn more about how Earth Engine handles scale in this doc. So far, you've been working with a single image with a single band. Now it's time to learn about multi-band images and image collections.